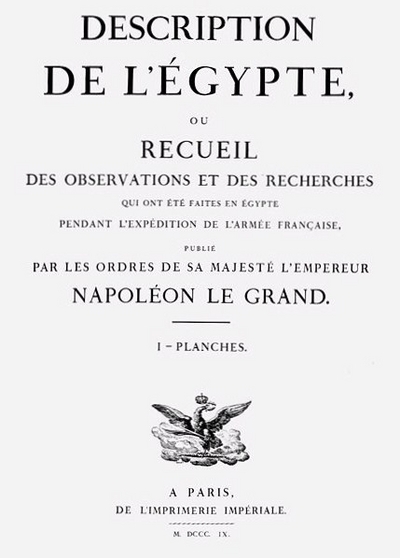 Title page of the first volume of the Description de l'Égypte (1809). 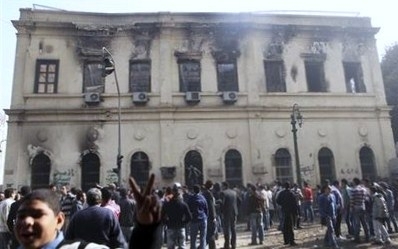 Founded in 1798 by the scientists accompanying Napoleon on his invasion of Egypt and author of the monumental 20-volume Description de l'Égypte (1809-28), L'Institut d' Égypte was burned down on Dec. 17 by crowds rampaging in the vicinity of the National Assembly building. Remarkably for a learned institution, its doors were open to the public to meander and imbibe, though few did. During my three-year residency in Cairo in the 1970s, it served as a place of refuge, when the city was too much with me, as well as a regular destination for my foreign visitors. I treasured this little-known gem for its library of 200,000 volumes focused on Egypt, its symbol as the capstone of Orientalist learning in Egypt, its evocation of a different and better era, and the quietude it offered in a city with few such oases. And now the barbarians came and destroyed it with a Molotov Cocktail. The walls still stand but the building is gutted, its invaluable contents burnt. The carcass of L'Institut d'Égypte. (2) The former minister of state for antiquities affairs, Zahi Hawass, campaigned for the return of the country's treasures. I vote against that. Better they be safe where they are than exposed to the fury of modern-day Egyptians, especially given that Egypt's mufti recently ruled against the private display of statues, a possible first step toward a state-sanctioned destruction of Egyptian antiquities. In addition, observers rightly worry that the incomparable Egyptian Museum may be targeted next.